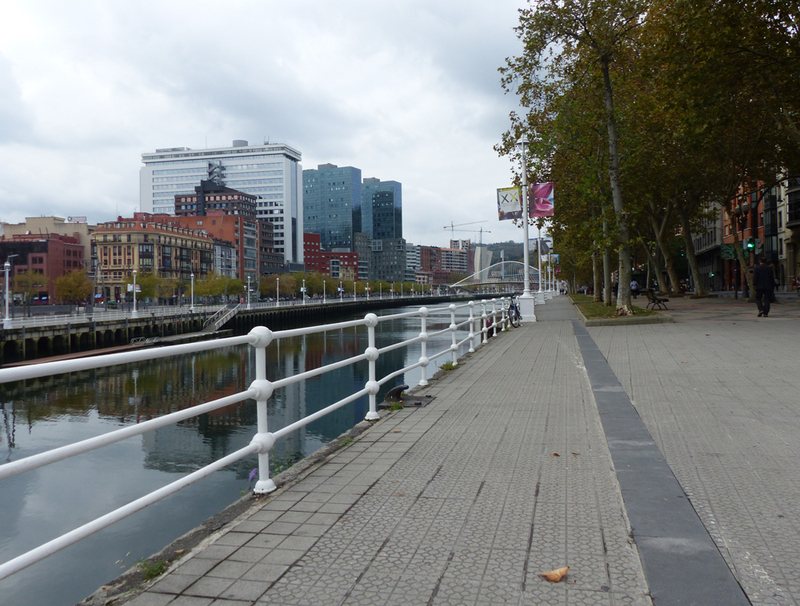 Helen and I recently went to Bilbao, Spain. We’d had a trip arranged in 2014, but I had disability-related complications at the time that cut the trip short and we didn’t make it. Before I go any further, I want to say that in every trip we have made to Spain,we have found that it really helps to have even a very basic ability to speak Spanish. Even just a little. There are free programs available (I like Duolingo a lot for this) on the Internet and tutorials on Youtube that can help you learn to get by. The people of Spain like it when we try, and it will enhance your vacation. 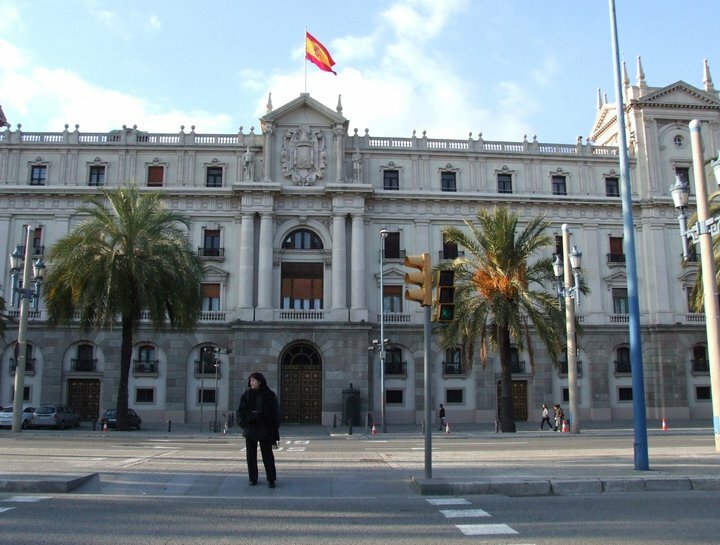 Don’t let a lack of ability in Spanish deter you from taking a trip to Spain, however. 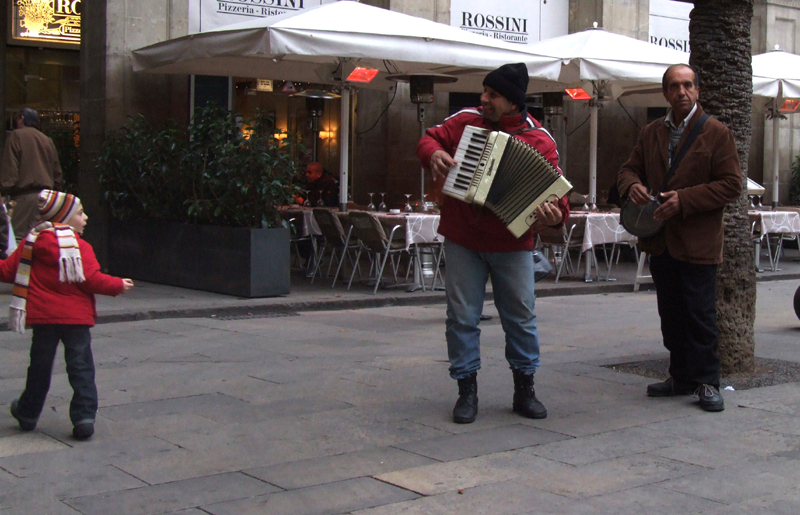 It can enhance your experience in Spain, but by no means is it necessary to be able to speak even a word of Spanish unless you get out of the more populated areas. The bus trip to the first stop from the airport (our stop) took a little over 20 minutes through some beautiful, scenery, including a close pass by the Guggenheim. Our hotel ( https://www.barcelo.com/en-gb/hotels/spain/bilbao/barcelo-bilbao-nervion/ , good disabled access room) was approximately a mile from our bus stop. The journey was relatively easy, with a working lift at one point where we encountered stairs, and only one stretch that I found difficult (the bridge cross the river. The gradient was ok, but it is paved with a slip-free surface that was somewhat akin to carpet, and so not quite as easy to traverse as a smooth surface). 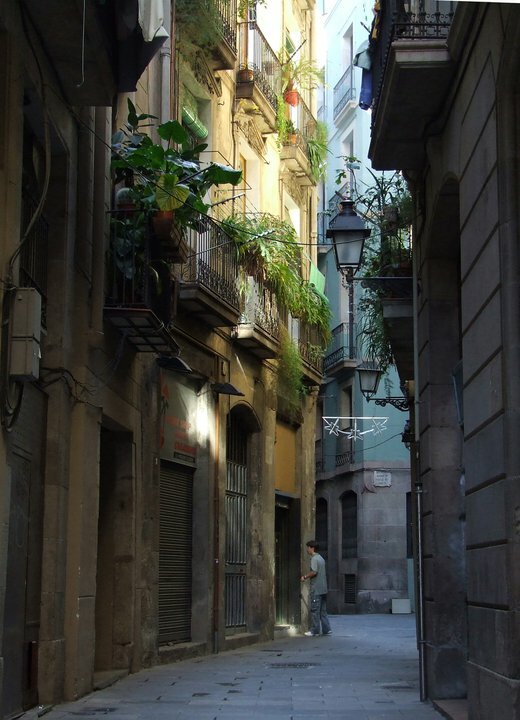 The surface of the sidewalks/pavements was very similar to that of Barcelona, which means that they were easy and cobble-free. On the East/North side of the river, there is a wide promenade that allows pedestrians and people in wheelchairs to walk/roll along the river without worrying about traffic. Pedestrian crossings are generally signal-lit with an audible assist for people with vision impairment. We had intended to visit the Guggenheim, and found our way to the Museum a short distance from our hotel, and were pleased to find that the entrance and interior of the museum appear to be completely accessible. 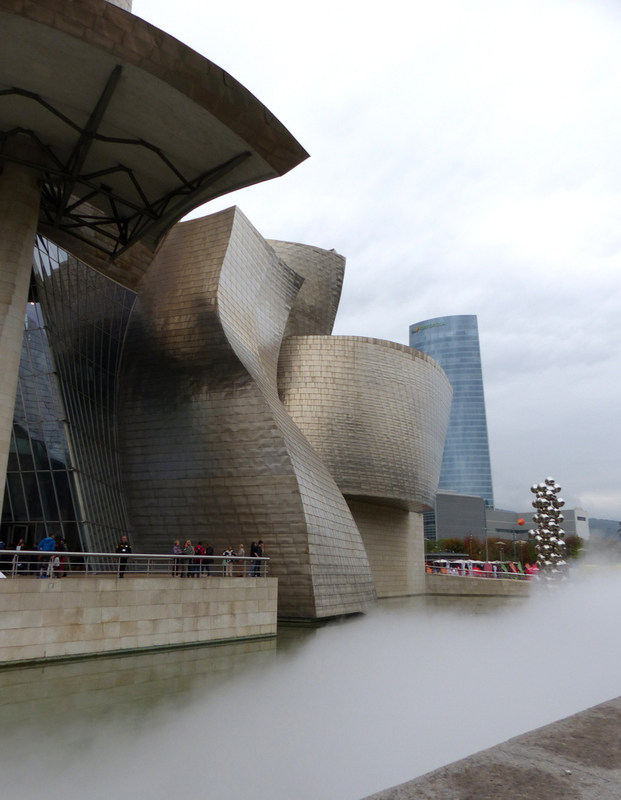 Unfortunately it was packed with local Bilbao residents who were taking deserved advantage of the Guggenheim’s generous policy of providing free admission to the people of the city. I don’t know if this happens every Sunday or maybe just the last Sunday of the month (when we were there), but for us it meant that we would have had to deal with a crowd unfortunately large in size, and so we decided to skip it, It wasn’t until later in the day that we discovered that the Guggenheim is not open on Mondays. Important note: The Guggenheim is not open on Mondays. 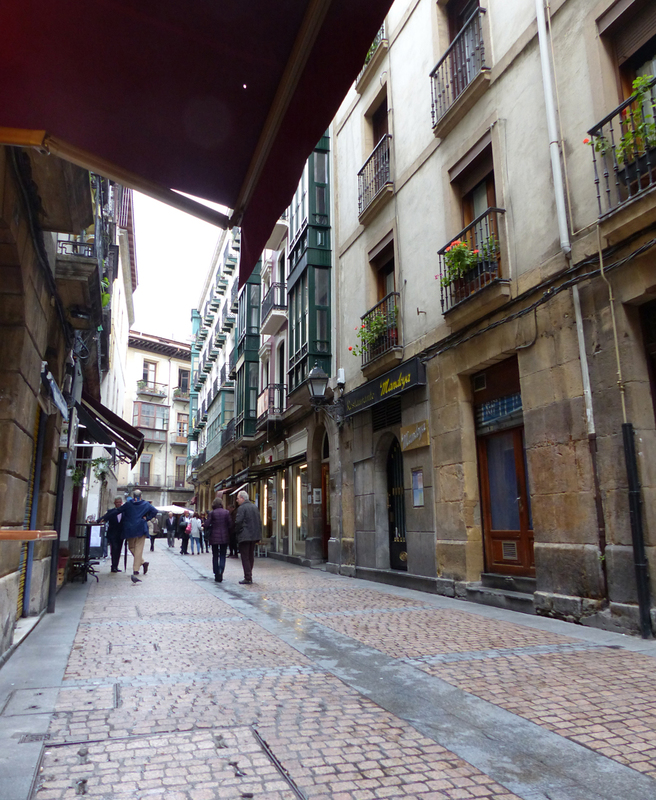 This freed us up for exploring the Casca Vieja, and so we spent the rest of our holiday in Old Bilbao. This part of the city was for me an extremely easy roll, no hills and only one or two very mild grades, with very little traffic and good rolling surfaces for my wheelchair. Most of the businesses had step-free access, and the weather was nice enough for us to sit outside when we sopped for a meal or a refreshing drink. I was very encouraged by the sheer number of other people in wheelchairs. I saw so many that I started to count them and by the time we left I had counted 23 separate people in wheelchairs in a span of three days. These were not multiple sightings of the same people. I have to say that I take this as a good sign regarding the ease of travel in a city. When there are a lot of other folks in chairs besides myself, it means that it’s easy to get around. 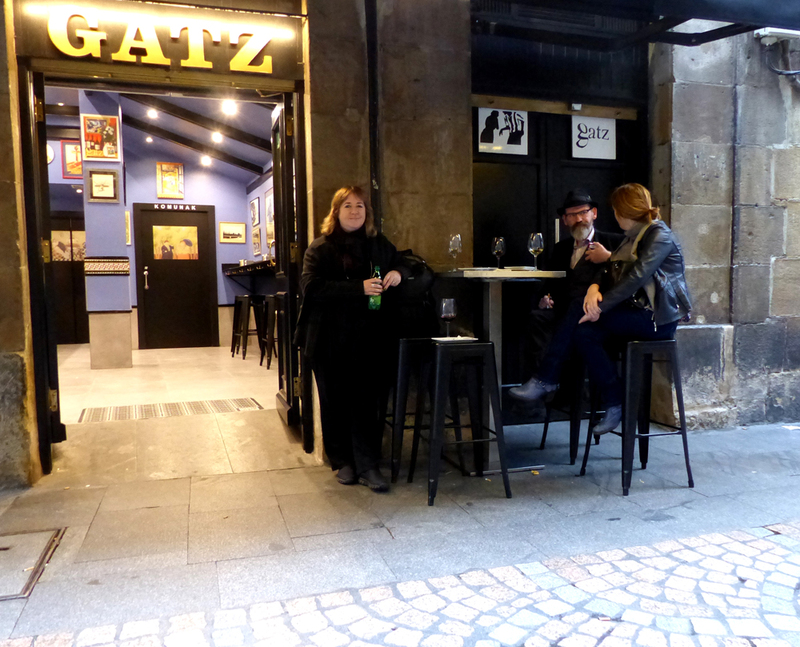 The weather in Bilbao is not as warm and sunny as Southern Spain, but it was mild enough for me to go out with just a hooded sweatshirt, and it only rained once (at which time we took advantage of some outdoor seating and whiled the time away over several glasses of very affordable wine). We ate outside for every meal, save one (that rainy night), and we enjoyed it. Important note: Check the weather forecasts before you go and be prepared to bring warmer clothes than would normally be typical for a visit to Spain. The highlight of our trip, according to my wife, our two dear travelling companions and myself was our “Pintxos Crawl” on our last day. Pintxos (pr Peenchos ) are the Basque take on Tapas; slightly smaller, with somewhat different ingredients. They are consumed–according to the “tradition” of a Pintxos Crawl—one at each Pintxos Bar, along with a drink, before moving on to the next. My wife did the research as to where we should go, and so by the time she and I left the hotel we had a little list of Pintxos Bars to try, with plans to meet up wth our companions somewhere near the beginning of our crawl. The first three establishments on Helen’s list were unfortunately closed (I believe it might have been because it was a Monday), but by the time we got to the fourth, we found it open and welcoming, with an easily accessible entrance. The counter of food was a little high up for me to be able to really see clearly, but the proprietor was very helpful, and we got two Pintxos and a glass of wine each, and ate outside while we waited for our friends to catch up. They did and we spent the rest of the afternoon and much of the evening in a slow, relaxing, leisurely stroll from one Pintxos bar to the next. It felt very civilized, and luxurious, and at one Euro eighty for the average Pintxo and the same amount for the accompanying copa de vino/glass of wine , it was very affordable as well. We had several other good meals in Bilbao, but the Pintxos were the stars in the crown. Important note: I could be wrong, but I believe that Tue-Sat would be the best days to embark on a Pintxos Crawl, as there will most likely be more establishments open.